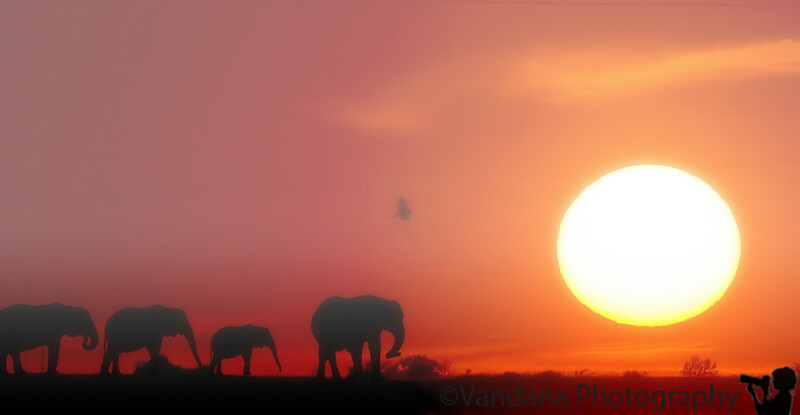 A composite image made from multiple elephant shots taken at the African Safari section of NC zoo, merged onto a sunset from New Mexico. This is the last of my fantasy compositions for now!, enuf of photoshop..now to shoot some real wildlife ! Flying to Tampa, FL in the next few hours( Saturday), then a Western Caribbean cruise starts Sunday !! We wanted to see some Mayan ruins before the world ends in 2012 ! If I have wireless, will connect with you all soon ! Fantastic composition! Have a fabulous trip! impressive work! have a great trip. Whoooeeeee -- stunning work! 10 stars**** My preference would be to have less haze on the left side of the image, but it still works. Have a fabulous trip! Superb creation...have a nice trip.